Install a new bowl gasket and then install the fuel bowl. Tighten the screws evenly in a cross pattern. Note: The top hole is offset to the right so the gasket will only fit one way. 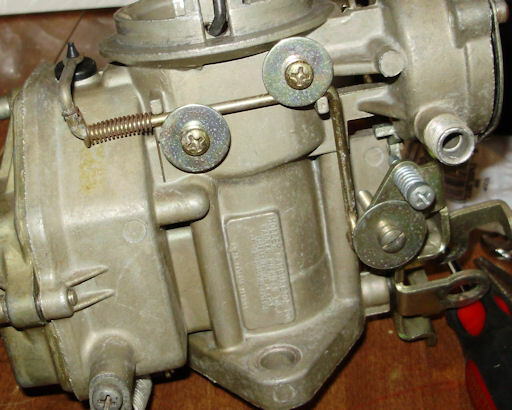 Install the spring on the fuel mixture screw and install the screw in the carburetor. 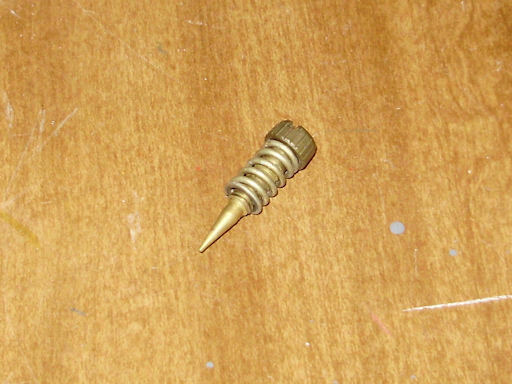 Lightly seat the screw using your fingers to tighten it and then turn the screw one turn to the left. 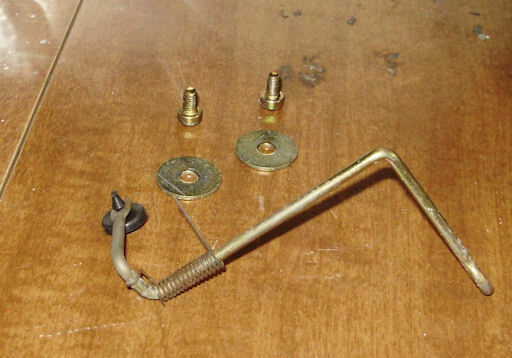 Note: The spring shown below is the wrong spring for the fuel mixture screw. This spring should be the lighter weight spring. Install a new valve on the end of the bowl vent rod and trim the excess so it looks like the picture below. 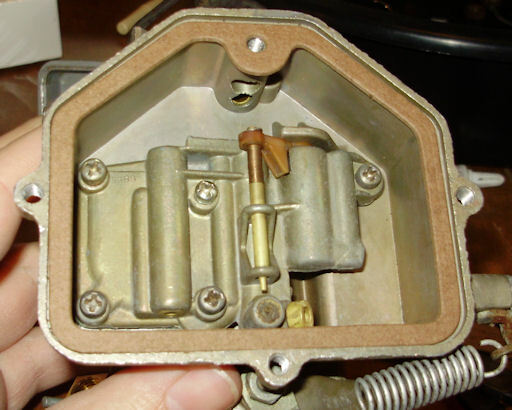 Install the bowl vent rod to the carburetor. Note: The long tail on the bowl vent spring must be installed so it points down as shown in the picture below. Start the car and allow to warm up. You may need to adjust the fast idle speed to keep the car running until it is warmed up. If the ignition system was not previously adjusted, adjust it now (point gap and initial timing). Re-install the air cleaner assembly. Once it is warmed up, set the idle speed to 600 RPM for manual transmission cars or 525 RPM in drive for automatic transmission cars. Slowly turn the mixture screw counterclockwise until engine speed drops off. Slowly turn the mixture screw clockwise until the engine speed is regained. Keep turning the screw until speed drops off. Slowly turn the mixture screw counterclockwise until max engine speed is regained. If the final RPM is more that 50 RPM different from the starting point, repeat the fuel mixture adjustment. Reset the curb idle speed (600 RPM for manual transmission cars or 525 RPM in drive for automatic transmission cars). Place the fast idle screw on the second step of the fast idle cam and adjust the idle speed to 1600 RPM.